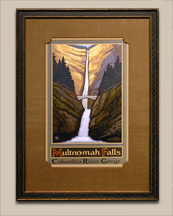 Paul A. Lanquist is a well-known Northwest artist who has worked as a commercial illustrator for over 20 years. 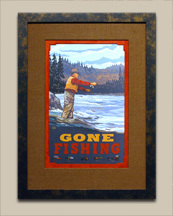 Pauls work depicts the style of illustrators from the 20's, 30's, and 40's. 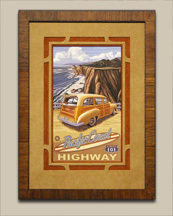 He combines this nostalgic look at the past with the natural beauty of the Northwest. 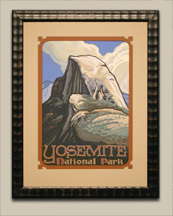 He also features work celebrating the beauty of other scenic areas of the United States. 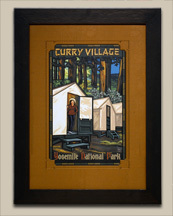 Pauls retro-style posters fit in well with Arts and Crafts, Victorian, and contemporary homes in the Bay Area and throughout the country. 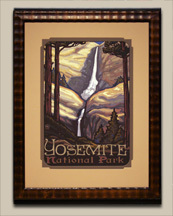 We feature several of Lanquist's Northern California images, and we can order any of his other posters for you. 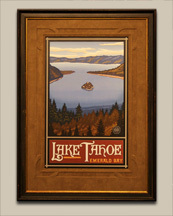 Paul Lanquist posters are available in two unframed sizes: 11x17 and 18 x 24. The sizes noted below are for the approximate size of the finished frames. We framed these posters using a variety of fabric mats with embossed design or specialty cuts, along with ultraviolet filtering acrylic, and cutom made frames. All framed poster have acid-free protection. You may order any poster with any of the framing combinations below. Just give us a call to order and we'll tell you what framing materials we have in stock and give you a price quote based upon materils availability, the poster size and your desired style. 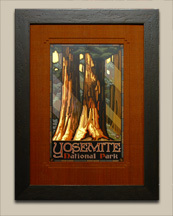 We can also accept special framing requests. Call (510) 849-4444. Click on an image below for an enlargement and further description. 14.5" x 21" Unframed $20. Click on an image above for an enlargement and further description.